Our feature film line up for 2017. You can go straight to the schedule at the link below. Charity is a huge part of martial arts, and with this in mind, Cine Asia have kindly agreed to sponsor an early bird showing of Ip Man: The Final Fight, directed by Herman Yau and starring Anthony Wong in the title role of Ip Man. This will be the first time the film has been screened in a cinema in the UK. All proceeds from this screening will go to the charity Medicinema, an organisation that helps people with complex illnesses and injuries to enjoy the cinema experience. Ip Man reluctantly begins a series of challenges from rival kung fu schools and is soon drawn into the dark and dangerous world of the Triads. In honour of John G Alvidsen, who sadly passed away in June, we will be presenting this classic. A deeply personal film not just for ourselves, but for an entire generation. Daniel (Ralph Macchio) moves to Southern California with his mother, Lucille (Randee Heller), but quickly finds himself the target of a group of bullies who study karate at the Cobra Kai dojo. Fortunately, Daniel befriends Mr. Miyagi (Noriyuki "Pat" Morita), an unassuming repairman who just happens to be a martial arts master himself. 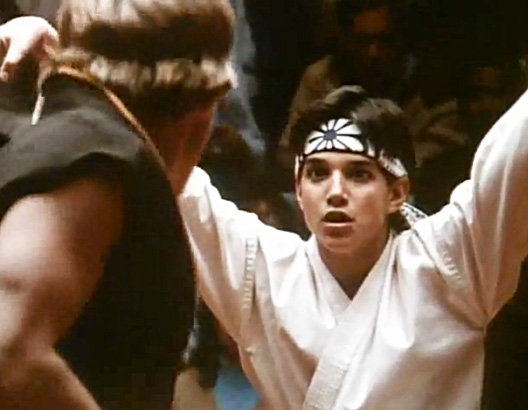 Miyagi takes Daniel under his wing, training him in a more compassionate form of karate and preparing him to compete against the brutal Cobra Kai. We bring you one of the most iconic Kung Fu films of all time. Consistently placed in critics all-time lists, this 1978 Shaw Brothers film even inspired Hip Hop legends Wu-Tang Clan. A timeless classic. The anti-Ching patriots, under the guidance of Ho Kuang-han, have secretly set up their base in Canton, disguised as school masters. During a brutal Manchu attack, Lui manages to escape and devotes himself to learning the martial arts in order to seek revenge. In a short period of time he masters the deadly use of his fists, feet and palms, along with such weapons as swords, sticks, and lances. With his learning complete, he takes on the Manchus. Our main feature will be RE:BORN, starring Tak Sakaguchi (Versus, Alive, Shinobi:Heart Under Blade) and directed by Yuji Shinomura (Flash Point, Warriors Way, Gantz:Perfect Wars). For RE:BORN they teamed up with fight choreographyer Yoshitaka Inagawa, a former close combat instructor for U.S. Special Forces and other international commando units. The film showcases Inugawa's Zero Range Combat System - a technique focused around extremely quick and efficient movements at close range. RE:BORN marks the comeback of Tak Sakaguchi - he's often called one of the most under-rated actors in the action movie scene, and this film highlights him at his very best. The action is incredible, and we at the Fighting Spirit Film Festival are very proud to be able to present the UK Premiere of RE:BORN for all of you. A legendary soldier with a mysterious past decides to unleash his inner beast to stand up for what he cares about.